Address: 9421 S. Old Oregon Inlet Rd. Improvements for the 2019 season include new quartz counter tops in the kitchen and new granite counters in each bathroom, 3 baths have all-new tile showers, new 14 seat Pennsylvania Amish dining room table and selected new Amish furnishings in the bedrooms. This home is being upgraded to a very high level to ensure a great vacation. Photos to be updated upon completion. This outstanding Oceanfront Home is loaded w/ an array of amenities designed to ensure a memorable Outer Banks Vacation for your entire family. Beautifully furnished & stylishly decorated, this home offers excellent views of the Ocean, breathtaking Sunset Views over the Sound, your own Private Oceanfront Swimming Pool & Hot Tub, & it even has an Elevator allowing for easy access to all floors (Not Wheel Chair Accessible). Very well equipped & spacious, there is plenty of room for everyone in your group to spread out & relax, after all isn't that what your vacation is all about? Ground Level: Parking for 4 Cars, Carport, 2 Exterior Steps to Elevator serving all Levels, Covered Entry, 2 Bedrooms (1 w/King & 1 w/2 Bunks, Shared Full Bath w/Tub/Shower, Large Game Room w/Foosball, Ping Pong Table, & 60-Game Arcade Machine, TV Area, Wet Bar w/Refrigerator, Half Bath off Game Room that Opens to Covered Deck Area w/Furniture, & Access to Private Oceanfront Swimming Pool w/Furniture, Outside Shower, & Walkway to Beach. Mid Level: 3 Bedrooms (Master Suite w/King & Full Bath w/Tub/Shower, 1 w/King, & 1 w/Duo Bunk), Shared Full Bath w/Tub/Shower, Rec. Room w/Pool Table, Queen Sleep Sofa, Stereo w/CD, & Wet Bar w/Refrigerator, Full Hall Bath, 2 Covered Decks w/Furniture (One w/Hot Tub), Steps to Ground Level, & Steps to Top Level. Top Level: Spectacular Living/Dining/Kitchen Area, TV, Stereo w/CD, Cathedral Ceiling, Half Bath, Master Suite w/King & Full Bath Jacuzzi Tub/Shower, Sun Deck w/Furniture, Great Ocean Views, & Steps to Mid Level. 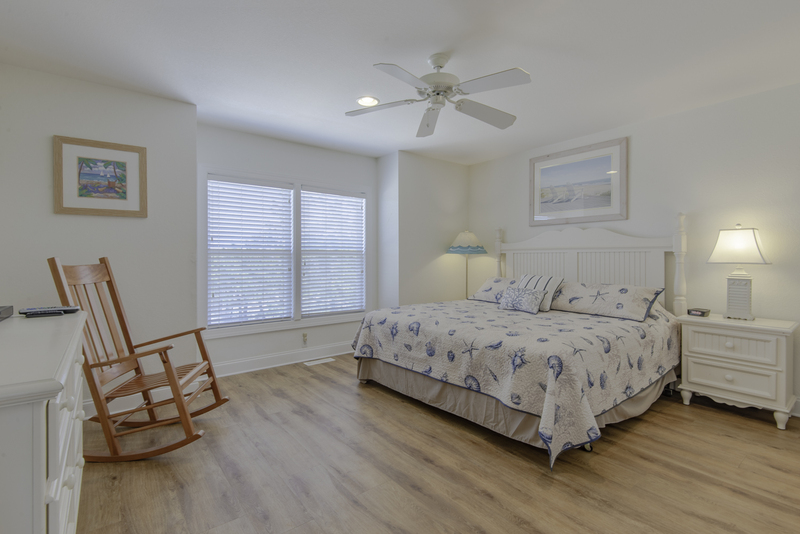 Features include: C/AC & Heat, Washer/Dryer, 2 Dishwashers, 3 Microwaves, 3 Refrigerators, Keurig Coffee Maker, Phone, 9 TVs, VCR, 4 DVDs, Wireless Internet, 2 Stereo's w/CD & Tape Player, Video Library, & Ceiling Fans. No Pets. This is a Non-Smoking Unit. The elevator sure helped with one handicapped person. The pool was superb. This was our second year staying there, and it was still in excellent condition. One of the nicest homes we've stayed in. The kitchen was very well equipped. This is a great house in a great location. Pool is great and plenty of shade in back of house. Pool table and ping pong table are great fun for later in night or on bad weather days. Your decorations are beautiful. It felt like a home away from home. The TV's were perfect for all to enjoy. Awesome upgrades. Especially enjoyed the new deck/pool furniture and flat screen TVs. Well equipped kitchen, comfy beds, and good selection of kids games/puzzles and books. Pretty decor. Just wish the parking area was a bit larger. Was a tad challenging to turn and maneuver vehicles. Overall, great rental! This house is lovely.I loved the bed spreads in most of the rooms. Decorations were lovely throughout the house. Excellent home with so many amenities! Great access to the beach and awesome views of sunset and sunrise!